This is the fourteenth Ordinary General Synod in fifty years since the inception of synods after the Second Vatican Council. There have been, in addition, three Extraordinary General Synods and ten Special Synods (dedicated to the geographical regions of the Church). The Vatican website’s definition of a synod begins in the following the manner. “I should mention that the Synod is neither a convention, nor a ‘parlour’, a parliament nor senate, where people make deals and reach a consensus. The Synod is rather an ecclesial expression, i.e., the Church that journeys together to understand reality with the eyes of faith and with the heart of God; it is the Church that questions herself with regard to her fidelity to the deposit of faith, which does not represent for the Church a museum to view, nor just something to safeguard, but is a living spring from which the Church drinks, to satisfy the thirst of, and illuminate the deposit of life. “The Synod works necessarily within the bosom of the Church and of the Holy People of God, to which we belong in the quality of shepherds — which is to say, as servants. “The Synod is also a protected space in which the Church experiences the action of the Holy Spirit. In the Synod, the Spirit speaks by means of the tongue of every person, who lets himself be guided by God, who always surprises, God, who reveals himself to little ones, who hides from the wise and intelligent; God who created the law and the Sabbath for man and not vice versa; by God, who leaves the 99 sheep to go in search of the one lost sheep; God who is always greater than our logic and our calculations. “Let us remember, however, that the Synod will be a space for the action of the Holy Spirit only if we participants put on apostolic courage, evangelical humility and trusting prayer. “Assume apostolic courage which refuses to be intimidated in the face of the temptations of the world that tend to extinguish the light of truth in the hearts of men, replacing it with small and temporary lights; nor even before the petrification of some hearts, which, despite good intentions, drive people away from God. The ‘apostolic courage to live life and not to make a museum of memories of our Christian life’ (Homily at Santa Marta, 28 April 2015). “Assume evangelical humility that is able to overcome its own conventions and prejudices in order to listen to Brother Bishops and be filled with God. Humility that leads neither to pointing a finger at, nor to judging others, but to hands outstretched helping people to rise again without ever feeling superior. Pope Francis’ exhortation to work together with apostolic courage, evangelical humility, and trusting prayer, is good for all Christian communities, including our own. Let us here at Saint Mary’s College take up his challenge in our work together this year on behalf of our students, the Church, and the world. 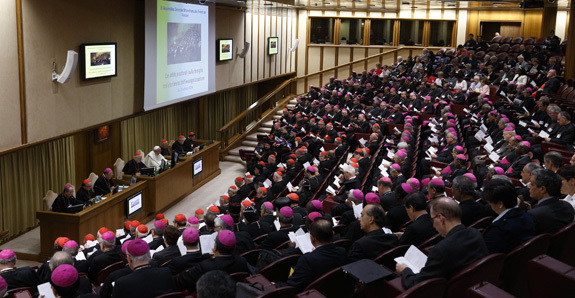 The Synod will continue until October 25. One of the anticipated outcomes will be the revision of the preparatory document (instrumentum laboris), based on reports coming from the small groups.